It’s time for homeschool art curriculum! 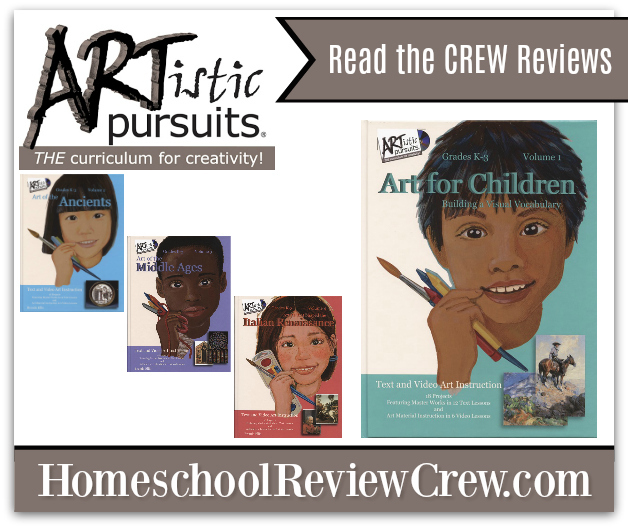 ARTistic Pursuits Inc. sent us some of their Artistic Pursuits Full Video Lesson Grades K-3 homeschool art curriculum to review! 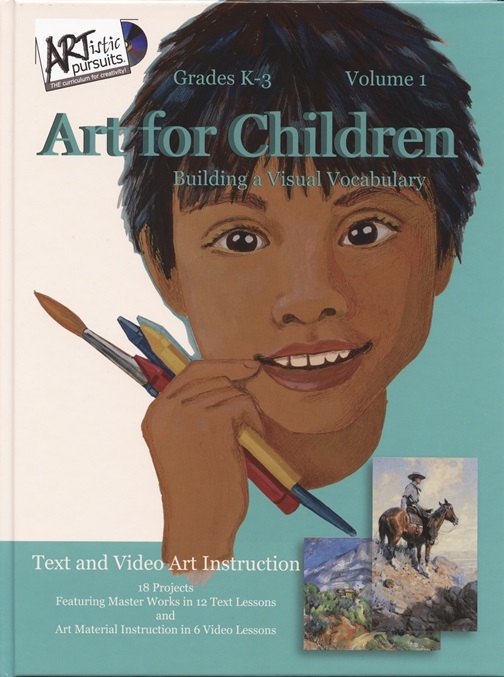 We’ve been using Art for Children, Building a Visual Vocabulary, but there are four total books available in the series. If you’re interested in the other books, you can find other Schoolhouse Review Crew reviews for those. We chose to try Art for Children, Building a Visual Vocabulary because my two younger daughters fit nicely in the age range. They were just finishing up Kindergarten and second grade. The printing, binding, and quality of the DVD are professional and very well done. I think that’s worth mentioning because with an art book it’s really nice to have the colors pop and the art examples clearly show brush strokes and texture. This book does that very well and the quality is great. It’s teaching children to look and observe rather than just copy, I think. My middle child is my most enthusiastic artist. This is her all set up with a variety of tools. We started with the watercolor crayon lessons but she wasn’t willing to follow all the rules about what tools she was supposed to use. In the spirit of letting things go and encouraging creativity, I let her use what she preferred. She switched around a lot. However, her drawings/paintings came out best when she used the tools that were suggested. In this picture she is using the mini-Rubik’s-cube and she’s supposed to copy it. You can see some of her prior attempts if you look to her side. All observe the variety of art tools that she’s got strewn around her and you’ll get an idea of the switching that went on. She really likes art, so we’ve got many art supplies that I’ve collected over the years. If I were just starting with this I think I’d just buy what is used in the book and try to introduce one at a time. The cat is out of the bag on this one for my kids, though. This was far beyond what my 6 year old could follow, and I dropped it with her for the most part. Her attention span is just too short for the video lessons. She did enjoy looking through the book with us and doing her own thing along with her sister, so if you’ve got a preschooler who wants to tag along but can’t do the lessons, I think it would work out. She might be ready for it in another six months and I’ll revisit it with her. Hi Lisa, Thank you so much for sharing your experiences. Children most often have difficulty working from direct observation when they’ve been exposed to a model of copying what someone else is doing, which is a common way for video lessons to be presented. Although it may be a difficult start, you are correct in thinking that your children will gain the skills it takes to draw in that way. And when they do they will be able and confident in drawing what ever subjects they see around them. We will teach more specifics on how to draw from observation in the upcoming Vol. 8, which your 8 year old may be ready for. It’s true, Artistic Pursuits has a different approach from what you find in other places. Thanks for giving it a try and let me know if you have any questions on any of the assignments. We are here for our customers through email and phone.